Applications opened Sunday for the Take Off Istanbul startup summit organized as part of Turkey's first aerospace and technology festival, the Turkey Technology Team Foundation (T3 Foundation) announced. The summit will be focused on startups from five strategic sectors, including Energy and Environmental Technology, Health and Wellness, Logistics, Space Technology and Defense, Education, and Agriculture and Food. The Take Off will be held on the sidelines of the TEKNOFEST Istanbul Aerospace and Technology Festival on Sept. 20-23 at the Istanbul New Airport. The three-day summit will unite more than 200 startups, 100 venture capitalists (VCs) and 150 corporations and offer visitors various keynote speeches, thematic panels and live interviews. 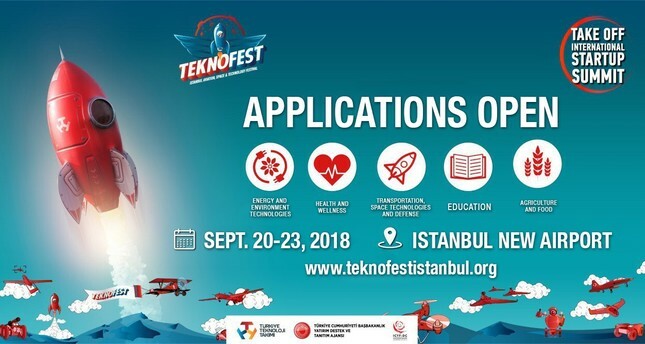 The TEKNOFEST Istanbul Aerospace and Technology Festival is organized under the leadership of the Turkey Technology Team Foundation (T3 Foundation) in cooperation with institutions that play an important role in Turkey's goal of realizing national technology thrust and becoming a society that produces. The most important part of the festival will be the technology competitions organized in 12 different categories. By providing competition teams with technical equipment support to design and develop their own projects during the preparation process, it is aimed at supporting the youth's technological developments. The competition accepts applications from a wide range of age groups, from secondary school students to higher education graduates.